Top prep QB Max Browne has committed to the Trojans after a three day visit at USC. 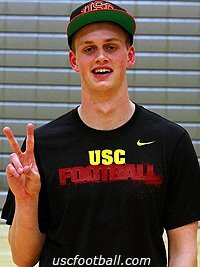 The 6 foot 5 QB from Skyline high in Sammamish Washington selected USC over Alabama, Oklahoma and Washington. As a junior he completed 70 percent of his passes for 4,034 yards and 45 touchdowns. looking foward to watching him.